Disclosure: I received a copy of the book to help faciliate the review. All opinions stated are genuine and my own. I have been curious about the Howard B. Wigglebottom series of books for children for awhile now. I hear about them from time to time, and people seem to love them, so when the opportunity to review one came about, I was happy to express my interest. 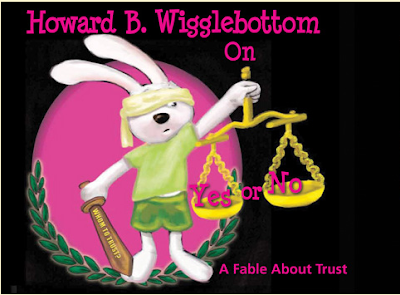 We received, "Howard B. Wigglebottom on Yes or No: A Fable About Trust." The pictures in the book were well drawn and fabulously full of color. The book is also a nice large size, for easy handling, and it's a hardcover (which I love!). The story was good, but in all honesty there were a couple of things in the book that left me a little surprised. One of the characters makes bad choices and the good Howard B. Wigglebottom wonders how he could do such things. A prime example being when the character is talked into stealing a cupcake. No repercussions are given, though at the end of the book the character in question is taught to discern between right and wrong, and not say yes to every little thing he is asked to do. I like the lesson of teaching children not to say, Yes!' to every request that is made of them from other children. The character in the story says yes to everything at the beginning of the story because he wants others to like him. I am sure that is something many children can relate to, at most any age, so I do like that they focused on the importance of not doing that for the moral of the story. You will find this book most anywhere books are sold in the US and Canada. The hardcover version retails for $15. You can also purchase them from https://wedolisten.org/ for the discounted price of $6.00, or select the whole set of 12 for $60. It is sold as an eBook on Apple for $3.99. This sounds like a really cute series of books! I'll have to look into it for my granddaughter! Sounds like something to get my great grand-baby for Christmas. Thanks for the wonderful review. Wow what a great lesson in this story. I know that even as adults it is hard to say no sometimes. These books must be for like 3- 7? Yes, 4+ is the recommended reading age. I agree. That's a great lesson. Even now sometimes, depending on the situation, I have trouble saying no, so it's great to start teaching kids this lesson while they're young. If you say the books are good, I'll go with you. How would I know. So, here's to Howard T.
I have never heard of these books before. I am going to have to encourage Allison to give them a try soon. Thanks for the review! My Grandson loves to read... well, he doesn't read well yet, but he loves books. So I am always looking for a good book for him. Sounds like a very good book for children Rosey! Learning life lessons from early is so important. Wonderful title, author! I will check those out; my gr-kids would enjoy them, almost as much as I would. I'll see if our library has the series. Should be quite interesting the topics covered! What an interesting book. I think I would probably have the same opinion as you in how the stealing was approached. I think the repercussions should be shown. The illustrations look great. Thanks so much for joining us on the Kid Lit Blog HOp. Thanks for linking into the KLBH, Rosey! For the longest time, my Max answered 'yes' to everything. Then things switched around and it was always 'no'. Now it's 'why'. Ah, the joy of toddlers!